Apple’s next major OS X update, dubbed El Capitan, was announced back at WWDC in June, and promised a number of under-the-hood improvements alongside some really useful new features. Following the subsequent releases of beta builds of the desktop OS, Apple has already started seeding the OS X El Capitan 10.11 Golden Master (GM) to members registered and enrolled in the Apple Developer Program, indicating that the final release is pretty near. However, we already have the final release date nailed – it’s arriving on Sept. 30th. What’s most interesting in this entire deal is how the official final release date was revealed. During the media event keynote yesterday, Apple included one sneaky screenshot of an email that can be clearly seen saying “The El Capitan ship date is September 30.” The pun is strengthened by the fact that the ending of the said email says, “P.S. Apple Confidential and Super Secret.” Way to let us know, Tim and team! 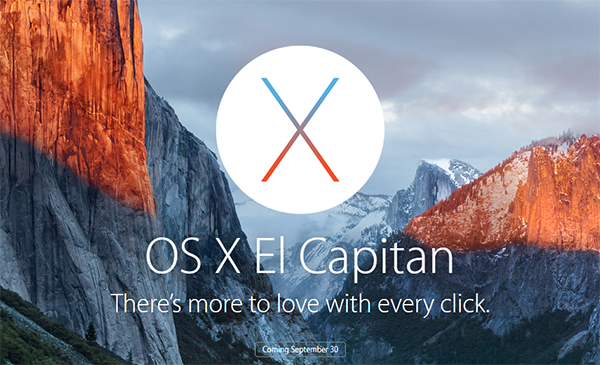 With Apple obviously making no secret of El Capitan’s launch date, heading over to the OS X web page at Apple’s website clearly tells the story now; come September 30th, El Capitan will be hitting all compatible Macs out there. El Capitan in itself is a fairly solid update. Beta versions of the OS indicate that it’s actually pretty solid and Apple has got things right from the get go. However, since there isn’t any major, earth-shattering feature that’s embracing OS X through this update, it might be fair to say that it’s an update within an update (with the previous update being Yosemite). This is also strengthened, to some extend, by the naming convention, where El Capitan actually is a landmark within the Yosemite National Park. However, this is just speculation and guess work, and should not in any way give you hope that El Capitan will be a small update (it might end up consuming more space than before, be warned). Meanwhile Apple is also seeding the GM versions of watchOS 2 and iOS 9 while beta versions of iOS 9.1 and tvOS are also available. Apple has also outlined the launch dates for iOS 9 and watchOS 2, both of which are set for public release on September 16. I updated five Macs yesterday, one of them was already running El Capitan, the update went moreorless without trouble. Open Directory logins still don’t work even though I started from scratch and I had to download the update twice because for some reason Caching Server didn’t catch the first one. Except for Metal, there is not must-have feature in El Capitan, Split View works only for full screen apps and apparently you cannot Split View two windows from the same app, thankfully I found this little piece of software on the Mac App Store that imitates Windows on that, it’s called HyperDock. It isn’t that smooth on multi-display Macs though. Battery life on my Retina MBP–the dual GPU one, hasn’t been great, I actually think it’s a little worse than before. This is the Mac I had been testing El Capitan on. I hope it improves with this last update. I get about 5 hours with a couple of text pages in Safari and Screen Sharing window at 95%. Wi-Fi issues should be fixed in next major update. Y tú cómo llegaste aquí!? Los días que andes Noé aquí aparezco, bueno, de hecho sólo un fin porque aún no me deshago de gastos. Parece que ya iba mejor pero de la nada llegó esta humedad deliciosa que me tiene en la ruina. Cuando te vea te cuento todo. Y prepara ese trago porque va a estar laaaaarga la convo!